Chalet Hay is a beautiful chalet set in a quarter of an acre of south facing garden, secluded but not isolated. Chalet Hay is a traditional style French mountain grange, over 400 years old and lovingly restored to a superb mountain retreat with wonderful views. It is perfectly located for all mountain holidays whatever the season.In the spring, summer and autumn the area is famous for fantastic walking and cycling, the pinnacle of which sees the Tour de France pass by the Chalet in July. Every mountain activity is available including canyoning, walking, golf, cycling, mountain biking, fishing, horse riding, rafting and paragliding. Families are well catered for, we ourselves having 3 small children and many activities are child friendly. The Chalet is extremely spacious and the garden secure with a gate. For a more relaxed holiday the area is renowned for its slow pace of life, fantastic climate, luxury spa, great food and number of places of interest. In winter it is only 10 minutes drive from the largest ski area in the French Pyrenees. You will have a truly fantastic holiday, we always do! We are Tristan and Lisa and we love the mountains. Skiing is our number one passion and after several years of looking and numerous ski and summer holidays we brought our dream chalet in 2007. The area has all the mountain sports and a traditional feel that we have not found elsewhere. After several working holidays to get the Chalet just how we want it, we now use the Chalet to relax and for great mountain activities. We hope you enjoy Chalet Hay as much as we do. We visit the Chalet as many times of the year as possible and find it the perfect place to get away from it all and relax. It is also a great place for us to take our family and friends! Perfect with children, there is an upstairs snug area with a tv and xbox and the garden will keep them entertained for hours on end! Our favourite activities include, reading a book in the garden on sunny days, eating out on the terrace and in local restaurants with some delicious red wine. Taking a night stroll under a million stars (no light pollution here! ), standing on top of the quatre therms ski lift with the Pic du midi in front and 4km of sweeping blue runs ahead. A typical winter day for us would be a family breakfast around the large dining table, heading up the mountain for a cheeky hot chocolate before the children head to ski school with our favourite english-speaking instructor Muriel, delicious lunch in La Schuss, a fun afternoon skiing with the kids and maybe a a few of us adults would meet up and head over to Laquette for the long tree lined runs and an afternoon beer. After the pistes close meet friends and enjoy some drinks in one of the restaurants and then participate in an evening activity such as husky dogs (brilliant), a ride in a piste basher, sledging or some night skiing. Or maybe a trip to the huge luxurious spa with the jacuzzis on the roof! Fab, fun filled days with family and friends! Bliss!! Bathroom 3 opened up for larger groups. Large corner sofa, large flat screen television, DVD player, stereo (iPod compatible), real log fire with safety gate. Fully fitted and equipped with cooker, hob, fridge, microwave, bar area. Highchair and other children's equipment. Only 10 minutes drive there is the Tourmalet ski area, the largest ski area in the French Pyrenees; 120km of pistes made up of 69 runs and loads of off piste skiing. Beginners can learn at La Mongie’s purpose built ski school area and practise their skills on the local green slopes. Intermediates can ski all the way to the village of Bareges which is located over the famous Col de Tourmalet pass and represents roughly 20km of skiing from one side of the domain to the other. For advanced intermediates there is plenty of challenging reds and blacks including moguls and heart-stoppingly steep blacks! For experts, free riders and tricksters the terrain park has all the kickers, half pipes and rails you need and pumps out some funky tunes! Off piste skiing is excellent and the Pic De Midi offers fantastic off-piste skiing opportunities. For the more leisurely skiers there are great restaurants in lovely sunny spots. There are also numerous other ski areas within easy reach. There are 5 18 hole courses within an hours drive. The closest is in Bagneres-de-Bigorre which is only 20 minutes away. This course is an 18 hole course with stunning panoramic views of the Pyrenees. It also has a driving range, clubhouse and English speaking lessons are available. Notes on accommodation: Chalet Hay is very spacious making it ideal for families and groups alike. It is secluded but not isolated and superbly located within the Campan Valley. Set within it's own private garden on the edge of the National Park. 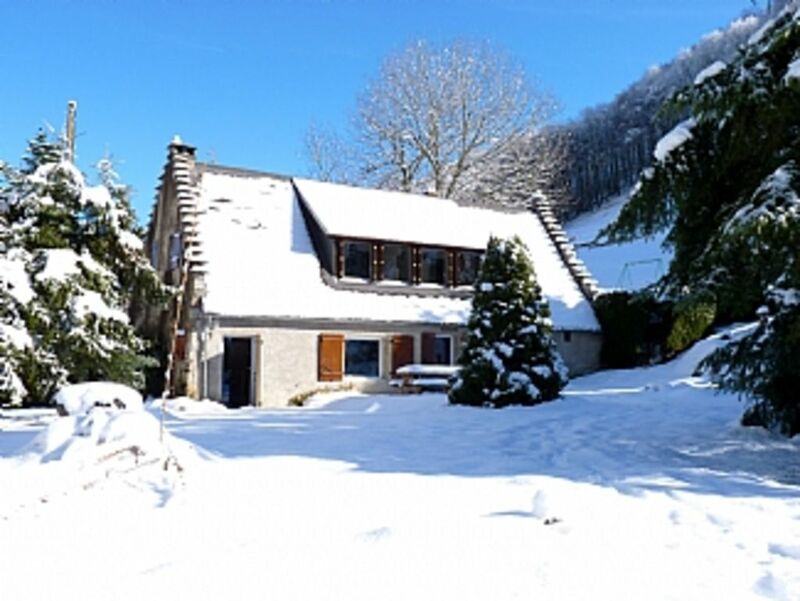 We have colleagues available in France to assist you during your stay at Chalet Hay. They can help with any questions or requests. See our website for lots more information on the chalet and the area. Outside: Large private landscaped south facing enclosed garden. BBQ and seating area. Play area. Terrace. Parking for several cars. Utility Room: Washing machine, dishwasher, additional fridge. Cleaning / Towels / Linen / Maid service: Bedlinen is included in the price. Towels are not included, but are available to hire for a small additional cost. A mid stay clean service is available at an additional cost if required. Other: Dining area with large table. Very helpful local support. Comfy beds, lovely wood burning stove and plenty of room indoors and out. Ideal for walking and wildlife viewing ( we were Spring visitors). The property was accurately described and clean, and its setting was even prettier that the photos on the Internet. I would recommend this property to friends and family. Chloe was very kind and helpful when we had queries. I can recommend the Auberge Lou Fabeclo at Beaudéan and the Céperie in Arreau for good, authentic French cuisine. In general, we has lunch out and breakfast and dinner at home. The lake at Payolle is worth a visit and the road continues over a pass with spectacular scenery. The same can be said for the road though La Mongie to the Cirque de Gavernie. There are many bicyclists on the roads in this area - it's a popular route for the Tour de France. Since guests arrive on Saturday after 3 pm, you should be aware that the local supermarkets (Intermarché, Lidl and Carrefour) are open until 8 pm, but are closed on Sunday. Lovely house, warm and welcoming. Well thought through. Everything you need. A great place to stay for skiing at La Mongie. All eight of us enjoyed a fantastic four night stay. It was lovely to "come home" to a log fire and such a comfortable, cosy well equipped chalet after enjoying a good days skiing. We will definitely be staying again. Brilliant week at Chalet Hay. The weather was fantastic which meant we did the full range of local activities (parapenting, extreme scootering, walking/mountaineering, white water rafting,.......all fuelled by great local food and drink! Marvellous chalet perfectly located for our cycling hols. The chalet has everything you need for pleasant and relaxing stay. The scenery from the chalet is stunning and Chole is on hand to attend to any problems, would definitely reccommend to fellow cyclists and can't wait to go back. Chalet Hay is perfect for cycling holidays in the Pyrenees. It is located on the Col du Tourmalet (about 3 km from its start in St Marie De Campan) route and a few miles from the col du Aspin, another tour De france Route. The chalet has room for bike storage and is positioned well for day trips to other areas for instance Luz Ardiden, Cauterets, Hautacam. To accommodate cyclists we are happy to offer shorter weekend breaks or training breaks out of peak season. please contact us via email and we will try to accommodate your requirements. The Atlantic coast is approximately a 2.5 hours drive and the Mediterranean coast is approximately 3.5 hours drive. Biarritz is the closest resort on the Atlantic coast, it has fantastic sandy beaches which are renowned for their cleanliness. This is a beautiful part of France great for relaxing and for water sports. By air - there are four airports within easy reach. Toulouse (2 hours by car (lots of airlines fly here)), Biarritz (2 hours by car (lots of airlines fly here)), Pau (1 hour 20 mins by car, (fly with CityJet)), Lourdes (1 hour by car (fly with RyanAir)). You can fly to one of the above airports from most UK and Ireland airports. By Road - driving to the Pyrenees is a great way of seeing France. You can also take a ferry to Bilbao and enjoy a spot of whale watching on the way! There are many places of interest within easy reach of Chalet Hay. Below are listed some of the key attractions however there are many more to be discovered! Bagneres-de-Biggore 20 mins. Pic Du Midi 10 mins. Lourdes 40 mins. Pau 1hr. Spain 50 mins. Cirque de Gavarnie Brèche de Roland 1hr 15 mins. Chateau Mauvezin 40 mins. Tourmalet Botanical Gardens 20 mins. Pont d'Espagne 1 hr. Les Grottes de Labastide 40 mins. Grottes Préhistoriques de Gargas 40 mins. Below is an list of just a few of the activities that this area of the Pyrenees has to offer right on the doorstep of Chalet Hay. Walking & Hiking - There are extensive marked routes in the area including the beautiful lakes of Payolle and Lac Blu and the stunning Lesponny Valley. Laya - An adventure and assault course through the forest in the Lesponne Valley, a 30 min drive away. Tour cycling - Road routes include the famous Tour de France concore the Col du Tourmalet climb only 10 mins from the house. Mountain biking - 23 marked off road trails and 337 km of marked trails all within the surrounding area of the Chalet. Paragliding - available across the valley, tandem flights available from a number of local schools. Rafting and other white water sports. Canyoning. Tennis. Spot the manikins in the Campan village from Spring onwards. A number of driving circuits have been written to take in the beauty of the area. Fishing (including trout & salmon fishing) roughly £5/day, rivers and lakes. Horse riding. Painting and photography. Golf at Bagneres and Tarbes. Sun bathing, the Pyrenees has as many sun days as the med coast does! Climbing in Beaudan. Strolling in the old town of Bagneres. And, a whole lot more! Booking Notes: A deposit of £200 is required at the time of booking to secure your booking. Final payment is required 60 days before arrival. For bookings made within 60 days of arrival, full payment is due at the time of booking. We also require a standard refundable security deposit on all reservations of £200, this is payable with the final payment, held by Home Away and repaid within 14 days of your departure. Changeover Day: Saturday to Saturday, however we will do our best to accommodate special requests. Guests are requested to arrive at the Chalet after 3pm on the day of arrival and leave before 10am on the day of departure. Notes on prices: Please note that our rates are based on a maximum of 9 people (excl. babies) sharing the 4 bedroom chalet. Weekly rentals run from Saturday to Saturday, alternative changeover days maybe available upon request. Prices for additional nights also available on request. There are optional extras available at an extra charge, such as towels..